Product prices and availability are accurate as of 2019-04-21 04:04:03 UTC and are subject to change. Any price and availability information displayed on http://www.amazon.com/ at the time of purchase will apply to the purchase of this product. 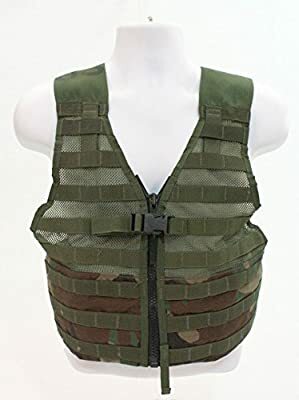 This vest is a component of Modular Lightweight Load-bearing Tools (MOLLE). That features the preferred mobile webbing add-on body; permitting numerous components to be carried ON the vest. Attach MOLLE components or even your very own with carabiner clips. Features 2 internal wallets. The screen face as well as open back concept maintain this vest extremely light-weight as well as highly convenient during any sort of task- also in the warmest temperatures. Zipper with additional simple release fastening face closing. Entirely flexible shoulder bands as well as midsection belt allows this vest to be put on over practically any sort of volume of garments.